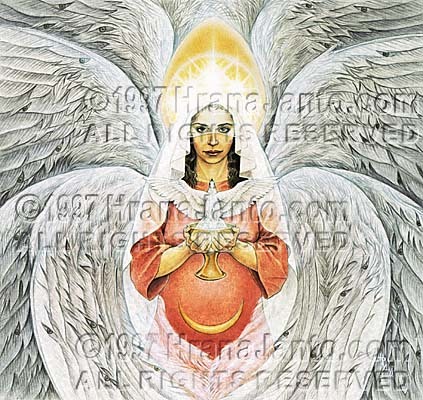 I painted Sophia in 1991 for Llewellyn's1992 Goddess Calendar. She is included in The Goddess Oracle, and is on the cover of the Brazilian edition. The Hebrew god Jehovah had Hokkma ("wisdom") from the first, and almost from the first this quality isolated itself in female form and became a demigoddess. Some contend that Hokkma was merely allegorical, but she speaks from the Bible in terms that make such a reading difficult to support. In two books--Proverbs and Ecclesiasticus--she makes particularly strong claims to a separate identity. The earliest creation of Jehovah, Hokkma was also his favorite. "At the first, before the beginning of earth," she brags in Proverbs, "when he established the heavens, I was there, when he drew out a circle on the face of the deep" (8:23, 28). Having established her temporal seniority, she further claims, "I was daily his delight" (8:30). It was Hokkma who cast her shadow on the primeval waters, stilling them so that creation could continue. It was Hokkma who gave consciousness to humankind, for humans crawled like worms until she endowed them with spirit. Hokkma goes so far as to call herself the playmate, even the wife, of Jehovah. Allegorical or not, this figure and others (Shekinah, Sabbath) undercut and softened the patriarchal religion of the Jews with their semidivine femininity.